A call to Camper & Nicholsons brings news that Simon Goldsworthy has signed the 37m sailing yacht Northern Spirit for sale. 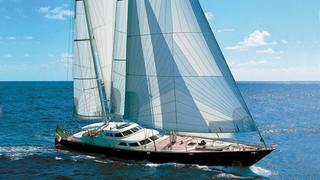 Styled by Bruce Farr, Northern Spirit was built by Perini Navi in 1996 and refitted in 2012. A warm cherrywood interior accommodates six guests in a master suite and two twin staterooms and she cruises at 9 knots. Northern Spirit is asking €4.95 million.